The St. Thomas Tommies are pleased to announce the addition of another recruit for the 2011-2012 season. Danielle Miller of Saskatoon, Saskatchewan will be wearing the green and gold this fall for STU. Danielle (Dani) is a 5' 10" forward who played Midget AAA hockey this past year for the Prince Albert A&W Bears of the SFMAAAHL and was second on her team in scoring with 30 points (15g, 15a) in 28 games. 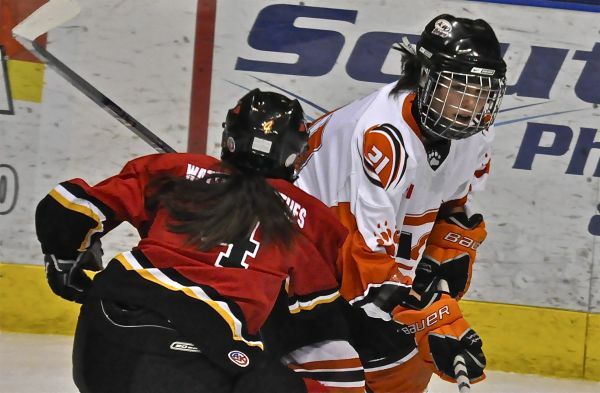 This was her first season in Midget Triple A and led the league in rookie scoring. Prior to moving to Prince Albert she played Midget AA hockey for 2 years in the Saskatoon Comets league. Dani is a gifted athlete and has also excelled in soccer, as well as in the classroom where she has been an honours student. Coach Murphy is excited to have Danielle coming to St. Thomas and have the opportunity to watch her take hockey and academics to the next level. Welcome Dani! A few minutes of youtube video featuring Dani.